Wheeling, W.Va. – Chevron and the Community Foundation for the Ohio Valley (CFOV) announce six recipients of grants from the Chevron Community Fund, a strategic grant-making program funded by Chevron and administered by the CFOV. The announcement was made during a recognition ceremony at Marshall County Family Resource Network in Moundsville on Monday, June 22. Upper Ohio Valley Sexual Assault Help Center – To enhance outreach efforts to sexual violence victims through increased awareness. The Chevron Fund holds two grant cycles annually. The next deadline for proposals is October 16, 2015. Applications are available on the CFOV website at www.cfov.org. 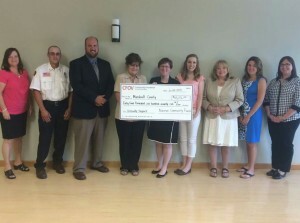 The Chevron Community Fund was established to support nonprofit organizations in and/or serving Marshall County. The focused funding areas are STEM education, workforce development and basic human needs.